Last Sunday, the biggest winners at the 2017 Emmy’s Awards were “Big Little Lies”, “The Handmaid’s Tale” and “Veep”. What I like about this year’s event is that women dominated! Here, I’m talking about women both behind and in front of the camera, as well as the stories about women! So, who won what at the Sunday’s Emmy’s Awards and why I find it important? “The Handmaid’s Tale”, by all means, won everything in every important field in which the series was nominated. This compelling drama won Lead and Supporting Actress in a Drama, Direction and Writing. Interestingly, Reed Morano is the first woman to win for Outstanding Directing in a Drama Series after 1995! The similar situation happened to “Big Little Lies”; this series is the winner of Lead and Supporting Actress, Supporting Actor, Outstanding Limited Series and Direction of a Limited Series. Finally, “Veep” has taken “home” the third consecutive Emmy’s Award for Outstanding Comedy Series, Julia Louis Dreyfus got her 6th consecutive Emmy for the performance as Selina Meyer. “Veep” also got its Emmy Awards for Writing and Directions. “Veep” Set Decorator Kimberly Wannop took home the award this year for Outstanding Production Design for a Narrative Program (Half-Hour or Less). After the awards, the Emmy recipient warmly thanked her peers. “I feel completely overwhelmed! The support from my peers tonight has been truly incredible! It’s a dream to win an Emmy and I’m thankful that my colleagues voted to make it come true! Thank you!”, said the new Los Angeles resident. The significant increase in female talent represented at this year’s Emmys was not only noted but celebrated by women across the board. 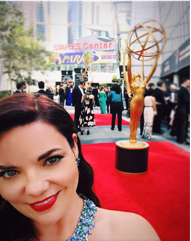 For Kimberly Wannop, taking home the Emmy was a dream come true, as well as an accomplishment she hopes will inspire the next generation of women below the line. “I think it is tremendous for the TV industry to acknowledge work done by women. I hope my win inspires the next generation of ladies in film and TV to dream big, strive for excellence and believe they can achieve anything,” she added. Lena Waithe got her Emmy for Outstanding Writing For a Comedy Series and she became the first black woman to get this honor! But, in her speech, she showed how powerful women are today, because Lena Waithe went a step further; she mentioned her “LGBQTIA family” and their day to day struggle to make the world a better, more beautiful place. The actress and the writer won for co-writing the episode of “Master of None” in which Denise, her own character, decides to reveal her sexuality to her family over the course of years of Thanksgivings. What makes this “Thanksgiving” episode really amazing is the fact that it’s based on Lena‘s own coming out experience. The 2017 Emmy’s Award was a beautiful showcase of the wealth of material led by women that is thriving on TV. Along with already mentioned “The Handmaid’s Tale”, “Veep” and “Big Little Lies”, there were nominations and awards for “Feud: Bette and Joan”, “The Crown”, “Better Things”, and “Grace and Frankie”. All of these TV shows are focused on the intimate lives of women, especially those powerful female characters. The patriarchy, sexism, misogyny, domestic abuse, as well as other women’s experiences received proper presentation in above mentioned shows. “Big Little Lies” was, in fact, born of the irritation and frustration of Nicole Kidman and Reese Witherspoon for the lack of amazing roles for women in TV or film. The two stars joined forces to make this wonderful TV series happen. “Big Little Lies” is the TV show based on the novel written by Liane Moriarty, also a woman. Take a closer look and you’ll see that women are behind and in front of the camera in these amazing, award-winning TV shows. No matter what anyone says, women rule TV industry nowadays! We have female-fronted content, female writers and directors, as well as amazing, brave and beautiful actresses. We have finally seen women on TV, with all their humanity and complexity, and at the 2017 Emmy’s Award women got the credit for their accomplishments. Kudos for that!